Listen. Men, I am here to set the record straight on this: fedoras are never okay. Nor are closely-related hats such as the trilby. No. Unless you are in the 1930s or heading to a theme party in full period-appropriate costume, just say no to the fedora. 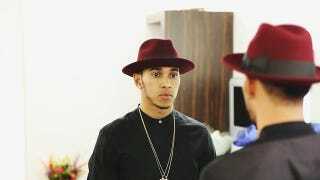 Even two-time Formula One world champions can't pull off the fedora. Let that sink in a bit. Are you even a one-time Formula One world champion? Well, it doesn't even matter if you've got nine Le Mans wins under your belt, because Tom Kristensen couldn't pull off a fedora, either. Nor could the Most Adorable Man In Racing Brendan Hartley. The fedora is a lady-killer in exactly the opposite way most wearers believe it to be. Namely, it kills all interest in the man underneath. It may have had an early association with the dapper and suave likes of Frank Sinatra, but it's since grown an uncomfortable association with immature nerds everywhere. I remember seeing these hats starting to appear on dudes' heads in junior high in the early 2000s. Back then, there was an innocence to the retro-themed hat. We were junior high kids, so experimenting with different looks and scenes was to be expected. Then we all grew out of it. (Or at least I hope we did.) Whenever a grown man tries to rock a fedora to impress the ladies, it gives the impression that he's mentally stuck in junior high. Ask yourself this: if I put on this hat, and I'm not headed to a theme party, will I look like I belong in my mom's basement arguing that someone is wrong on the internet about obscure details found in a "My Little Pony" episode? If you want to incorporate costume wear into your daily wardrobe, my suggestion is always going to be the viking helmet. Ain't nobody gonna mess with a looney tune in a viking helmet. If you can't pull off a viking helmet without looking like you need to be committed, just stick with a normal, 2010s-appropriate hat.